Denis White only attended one Miami hockey game at Cady Arena, but a part of him is in Oxford every time the RedHawks lace up the skates at their home rink. Like the other thousand-plus games he saw played by numerous Cincinnati teams in several leagues in his decades-long career, he loved his only experience at the Goggin Ice Center. Denis White in his goal judge box at Cincinnati Gardens. He loved the game, and he felt that way long before hockey was even remotely popular in this area. White, the father of BoB photographer Cathy Lachmann, passed away on Feb. 21 at age 83 after spending nearly half of his life as a goal judge. And whether it was Cincinnati Gardens or the Coliseum, the Stingers, Swords, Tigers or Cyclones, Denis could be found behind the cage, finger on the trigger, ready to light the lamp that signified a goal. White grew up in Chicago, where he was a die-hard Blackhawks fan. After moving to Tulsa briefly and working as an off-ice official there for the minor-league Oilers in the 1960s, he brought his passion for the game to the Cincinnati area. From then on, he was a fixture at the Queen City’s major rinks. In a stretch of 30 years, he missed four games. His adoration of hockey was eclipsed only by his love of family, and fortunately for him, the two overlapped. 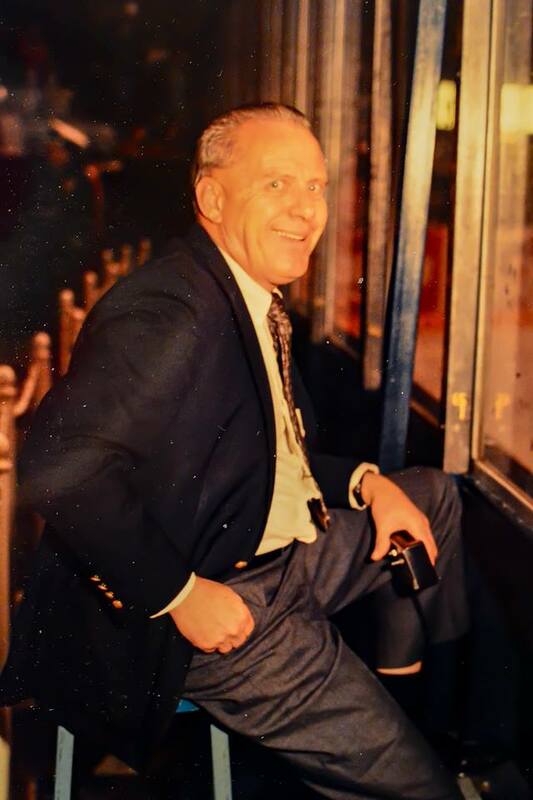 Judy, his wife, watched almost every game Denis worked, and his other daughters, Julie and Betsy, also caught the hockey bug and are both still huge fans of the sport he was so fond of. The highlight of his career was in the early 1990s, when Cathy and Denis worked the two nets as off-ice officials. It is the only documented occurrence of a father-daughter goal-judge tandem in this area. Denis passed along numerous exemplary traits to Cathy, and from a hockey perspective, her eye for the game is his most evident gift. Denis White gives Cathy away at her wedding in Ottawa, Canada. Fortunately for Miami fans, that attribute lives on through Cathy’s photography. Though she had no former training in that field, her knowledge of the game made her a natural, as she can anticipate plays as well as anyone at the rink, and that hockey acumen enables her to capture optimal images. She can be seen on game night shooting from her season-ticket seat in the front row of Section 12, the end zones or the standing-room section directly behind the penalty boxes. Also like her dad, she is a rink rat, as she has missed three regular season home games in the 11 years Cady Arena has been open – one for a family funeral and a weekend series when she married. 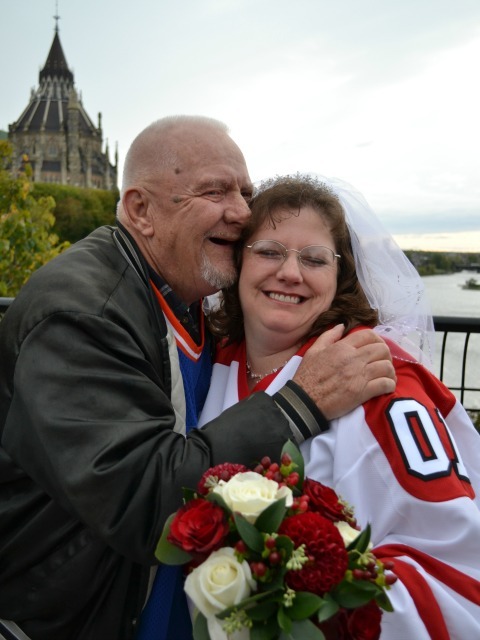 And she tied the knot in Ottawa, Canada, in a Miami jersey. Denis was there to give her away in a Tulsa Oilers sweater. Denis may no longer be with us in body, but he lives on through Cathy’s hockey fervor every time the RedHawks take the ice in Oxford. Posted on February 27, 2017, in 2016-17 and tagged 2016-17 miami redhawks, cathy lachmann, denis white. Bookmark the permalink. 1 Comment. Thanks for sharing this story, John. We’re all thinking about Cathy, you and your family from Colorado tonight.